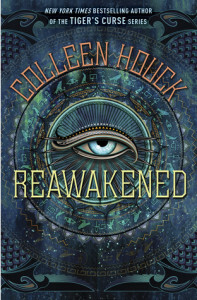 I loved Colleen Houck’s Tiger Series so when I saw she started a new series based Egypt, something I love, I had to have it. Lilliana is a New Yorker who’s parents expect her to choose the right path, especially when it comes to schools and influential connections. She’s torn over her decision when she goes to the Met to ponder it out. Once there however, she’s confronted with a real life mummy, Amon, that’s come to life and needs her help to stop an evil power from forming. Amon and Lily race against time to wake his brothers and stop an evil curse. If they fail, Seth, the God of Chaos, will plunge the world into darkness. If you liked Colleen’s Tiger books then this will be right up your alley! I found them to be extremely similar (in a good way!) in pacing and style. You’re constantly wanting to continue reading to see what happens next because something even more incredible is just around the corner for these characters. I really liked Lily. Ms. Houck did a great job of showing how difficult it is for someone her age to essentially pick what they’re going to do for the rest of their life. I loved how Lily struggles with who she wants to be and who she’s expected to be. Meeting Amon really challenges her to figure that out. Amon was a great match for her; taking her out of her comfort zone and exposing her to new ideas, which she does for him in return. His brothers were also fantastic. I loved me some Asten. Ahmose was sweet and caring behind his big build. Houck really knows how to write hot fictional men! I happen to love Egyptian history and lore so this book was heaven for me. I loved the backstories that Houck goes into incorporating different Gods’ histories and how they impact the plot. The beginning was a TAD slow, but it quickly picks up and that ending! COME ON! I need the second book like now. Ok? Thanks. Great review! I loved this one too. The mythology and lore was fantastic. Plus the characters, Asten and Ahmose? Love. I wish they had a larger role in the book because they were so great. Cassi, I LOVE Asten and Ahmose! I have a feeling they’re going to play a larger role in the forthcoming books….at least I HOPE so! !